I wanted to do a quick post / review on a beautiful product I v kindly received from Jo Browne a short time ago, a *Jo Browne Ireland Natural Solid Perfume (24 Euro) – a natural solid perfume with organic beeswax. Joanne Browne, is the founder and creator of Jo Browne Natural Solid perfume and you can learn more about Joanne, background on this product, her range of fragrances, stockists via the link here. There are currently five fragrance notes to purchase in the range, three female; floral, oriental and sweet note and two male; oriental and woody note. I kindly received the Floral note fragrance which is a combination of lemongrass-wild jasmine with organic Beeswax. The Jo Browne Ireland Natural Solid Perfume is a twist up solid perfume which comes in a beautifully embossed tube with push on cap. JB logo and details are lazered onto the tube which I love. 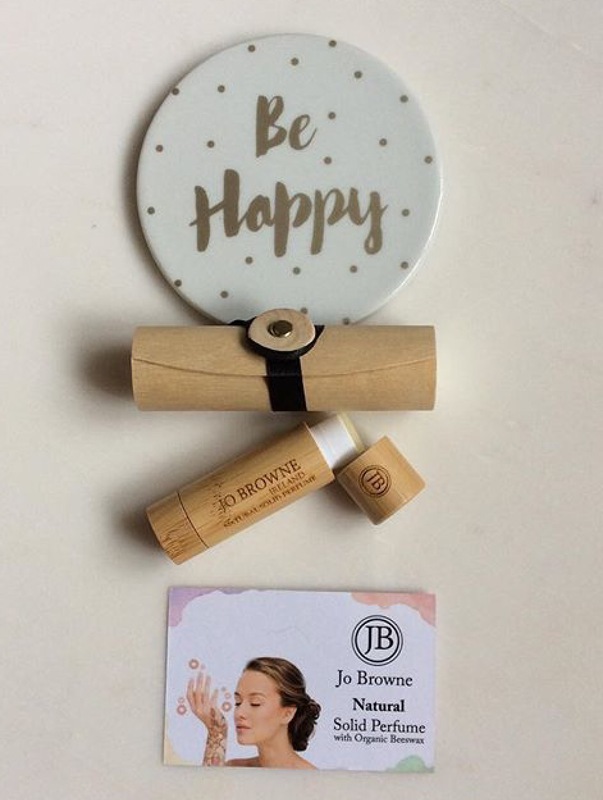 In addition mine came in an outer light bamboo gift packaging (see photos below) – states on the Jo Browne site ‘Free Gift Bamboo tube with every perfume purchase before xmas’. Floral note is a beautiful natural fresh uplifting ‘happy’ fragrance, but not overpowering which I love, so easy to apply, might drag a bit when you first apply but I find if you have applied a non fragrance natural moisturiser a short time before, let dry and then apply this helps. This is the perfect perfume for your handbag & travelling as no worry about spillage, breakage and I just adore the packaging as well as it is so unique and beautiful. However you may find smell does not last as long as some fragrances however this is not a problem for me as it is so easy to apply again, as and when you need to. You can currently purchase online at Jo Browne.com as well as at a number of different stores (seen on facebook was also to have launched in the Avoca Belfast store last week so need to check this out this week). I am sure it will not be long till even more stores are stocking this range as it is such a beautiful, natural product. Also currently to celebrate that the Jo Browne company is now one year old when you enter code ‘OneYear’ online at Jo Browne.com you will receive 20% discount – think valid until 18.07.17. I will definitely we checking out the other fragrances and highly recommend checking them out for yourselves as such a stunning product, perfect for yourself or as beautiful gifts. Love the way all the details are lazered on the packaging which makes it also the perfect gift if you are on holidays here and want to take gifts from Ireland home as when the perfume is finished still a beautiful momento of your holidays to keep. Not sure of Joanne has thought about this but I think it would also be lovely if you could just purchase refills, not sure if viable but think it would be perfect if it was. Thank you again Joanne (Jo Browne.com) for giving me the opportunity to try your beautiful product – I am definitely a fan now.